Pandit Sundar Lal Sharma Open University (PSSOU) – was established by the Chhattisgarh Legislature in the 55th year of the Republic of India on January 20, 2005. The University is situated in Bilaspur, Chhattisgarh. PSSOU is the only university in the state to provide Open and Distance Learning in the state. The objective of the University is to operate in the entire region of Chhattisgarh, provide quality education and establish study centres at maximum possible blocks of Chhattisgarh and in the places. The University provided online study material through which students will be able to prepare for the examination conducted by the university. Check the article for details of PPSOU courses, fee structure, study centres and regional centres. The University offers various programmes in various courses. There is a total of seven regional centres under the University. The Regional centres handle 143 study centres. There 8 Academic departments and 20 boards of studies in Pandit Sundarlal Sharma Open University. The University provides E-Study material and SLM for the students. The University offers various programmes. Check the list of the programme offered in the University. Check the table for the courses offered in Pt. 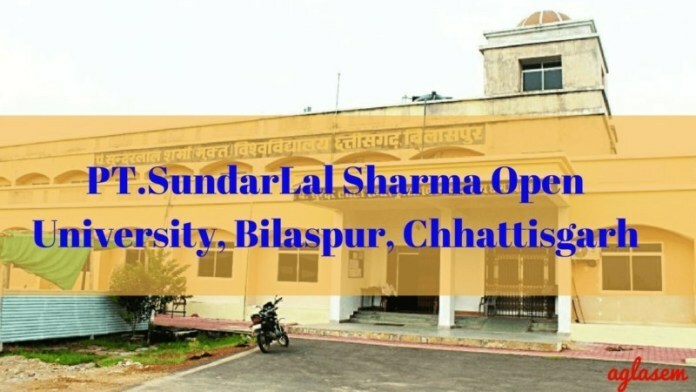 Sundar Lal Sharma Open University. The fees differ from courses to courses. Check the table for the fee structure of PPSOU different courses. There are 7 Regional Centre organized by the University. Check the list of the Regional Centre. There 143 Study Centre Under the seven Regional Centre. Check the list of the Study Centres regional centres wise.